Andrea Bonner of Red Hill Home curates a growing collection of vintage items gathered from auctions, estate sales and barns near her home in New Hampshire. She inherited a love of antiquing and treasure-hunting from her mother; now that her two kids are grown and her career in social work was put on hold, Andrea has seized the opportunity to bring her passion to Etsy. Your shop photos are clean, crisp and cohesive. What’s your secret? It’s been a real work in progress. I never took the family photos after my kids got old enough to take them – mine were always out of focus, heads were missing and nothing was ever centered. When I joined Etsy, it became apparent that good photographs are very important. I bought a camera and started practicing. I tried an online class but it was way over my head. I’ve been able to improve over time, but I still struggle with exposure and lighting. I follow the light around my house. This summer it was best in my garage; in the winter it’s better in my bedroom. I love artwork and have a hard time photographing it due to the glare on the glass, so I haven’t been able to offer as much art as I have ready to sell. I’ve learned to edit down the photo in my mind before I shoot. In the beginning, my love of vignettes had me adding too many objects into the mix making it difficult to highlight the item for sale. Since I’m photographically-challenged I need to keep it simple. I hope that in selling items that I find beautiful perhaps the pleasure in the pieces comes across. I take many, many shots to get the right one. Do you collect items for your shop that you love, or target items that have a better chance of selling? Old things call to me and I can’t resist. 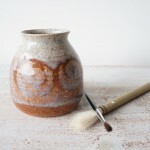 All the items in my shop are things that I love and would have in my home. I’m drawn to objects of all eras. 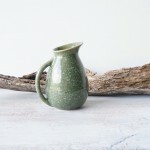 Some items that I especially like, such as arts and crafts pottery, seem to sell well – I would target them for the shop if I could find them more often at reasonable prices. I love to go to auctions and estate sales, poke around in barns and visit antique shops. My shop is an outlet for my passion. I love when someone on Antiques Roadshow finds out their item is worth more than they thought. Have you had any finds that surprised you with their value? I bought an etching that I loved at an auction for myself; when I looked up the artist, I was pleased to find out it was by a well-known American engraver. Nothing extravagantly valuable, but it’s fun to know that I had a “good eye” and that his works are appreciated by folks (and a few museums) other than me! 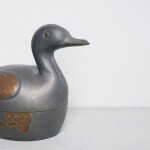 Are you ever tempted to buy vintage items from your competitors on Etsy? Oh YES! There are so many beautiful things to buy on Etsy; I’ve bought gifts for friends from other sellers. Etsy is a visual feast for someone like me. What’s your experience been like participating in teams on Etsy? I belong to several teams and have found them helpful and supportive. For me, Etsy is a big marketplace and team members are like the shop owners next door – you visit, share stories, get and give advice. I’m still learning about SEO and best listing practices from the wealth of information in the forums and teams. I do believe that treasuries done by teams help to get items noticed by potential buyers – and I enjoy making them. 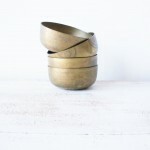 I know that I’ve made sales from my shop being featured in treasuries. I’ve tried to pay it forward and back by creating treasuries and participating in discussions. The teams are a huge resource, particularly as you start out on Etsy. With more and more sellers opening vintage shops on Etsy, how do you stand out from the crowd? I hope that I do stand out – there are so many great sellers and items to choose from. I try to offer a quick turnaround with next day shipping the norm. I also try to keep prices competitive even if it cuts deeply into any profit. I want folks to know I’ll offer only quality at a good price, with superior customer service. Continuing to work on better presentation through better photography is a must as well. 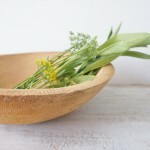 I love the Asian brass-etched bowls – what’s the story behind these wonderful pieces? I’m so glad you like those bowls; I love their warmth and age. I bought the bowls at an estate sale of a respected New Hampshire photographer and teacher at Boston University. 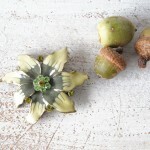 They were calling to me from a box piled high with magazines – they were hiding underneath! I wish I knew more about where the gentleman got them, but I like to imagine all the hands that may have held them and given them the wonderful warm and worn patina. 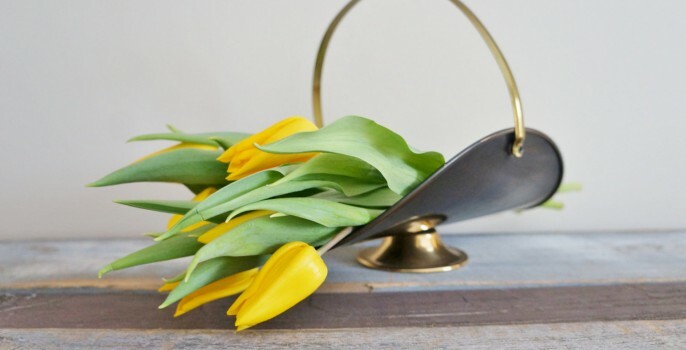 Many of your items are brass – do you have special memories that make this metal appealing? I’m drawn to all metals (like a crow! 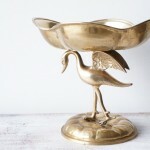 ), but particularly brass and pewter. My mother collected little brass animals – I would build shoebox houses for them. My father had some old Filipino pewter from his missionary grandparents. My mother had a love of antiques that she passed along to me. She and I spent many wonderful hours together in antique, vintage and thrift shops as I was growing up. My mother has Alzheimer’s and lived with me and my family for four years so that we could care for her. Right up until she could no longer get out, we went antiquing together. Those are special memories for me, so perhaps that’s why I go for brass and pewter pieces. Have there been items in your shop with special significance that were hard to let go? Whenever I get ready to put an item in the shop, my husband jokes “Oh no, you can’t sell that one!” I have a lot of trouble letting pretty things go. The hardest item to sell was a brass sailboat. I bought it after my father passed away – he loved to sail and I knew he would have loved the piece for his den. It so reminded me of him. When I decided to let it go, it was bought as a gift for someone else’s dad – a gift of love to be enjoyed by someone in the present. That was a wonderful and special sale for me. I notice you have a Tumblr account; Tumblr is a mystery to many Etsy sellers. How has the site treated you? Tumblr has been like photography for me – learning as I go. I enjoy the site, but don’t generate a lot of traffic from there to my shop. I’d like to convert my page to more of a blog than a simple collage of style or “likes” as I have it now. I think that’s when it seems to be more successful as a tool. Do you sell on any venues besides Etsy? I sell occasionally on eBay – rarely and only specialty items, like military memorabilia. It’s my dream to open a brick and mortar shop, with a blog and Facebook page to go with it. That’s the next step for me in this process that started with Etsy. Opening a brick and mortar shop is ambitious – but Andrea is no stranger to ambition. She’s on a quest to join the Four Thousand Footer Club (FTFC), a small group of people that have climbed all 48 peaks over 4,000 feet in the White Mountains of New Hampshire. She’s over halfway there, go Andrea! 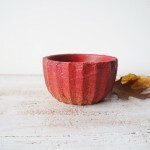 Visit Andrea at Tumblr, Pinterest – and of course at her Etsy shop, Red Hill Home.